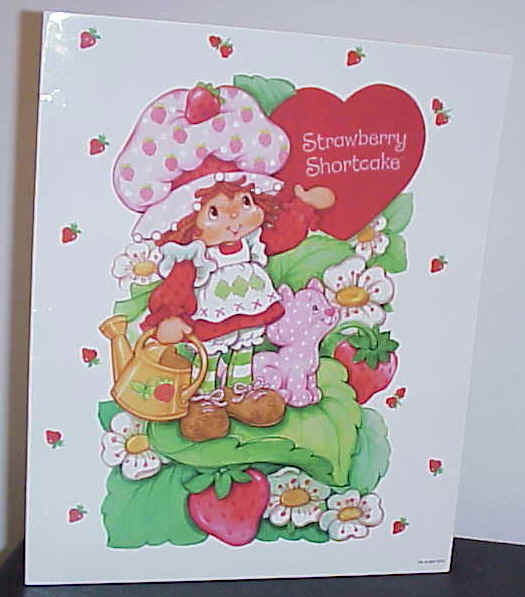 Vintage 1983 Strawberry Shortcake American Greeting Holiday Library. 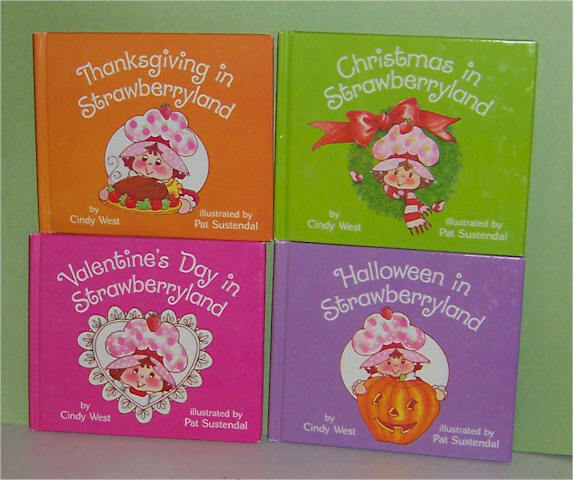 Includes Valentine's Day, Halloween, Thanksgiving and Christmas Books. 4 3/4" x 4" Wonderful little books. Comes with case to hold them in. Very good condition. Strawberry Shortcake and her friend, Pupcake Ornament. In her traditional red dress, bloomers, and hat. Strawberry Scented. The Care Bears have come out of hibernation after 20 years and are the hottest gift this Christmas! 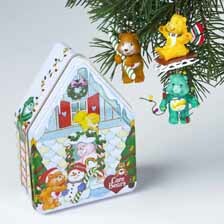 Don't miss out on this highly collectible tin with three miniature Care Bears ornaments. 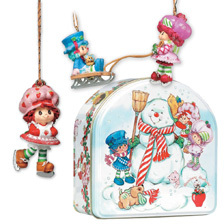 Set includes three miniature ornaments of Strawberry Shortcake and her two buddies, Blueberry Muffin and Raspberry Tart! 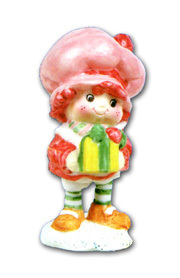 Strawberry Shortcake is wearing a colorful holiday scarf and is carrying a very special gift. She's eager to get home to Custard and her cozy strawberry house, for she knows that nothing says "Christmas" like a warm welcome from someone you love! 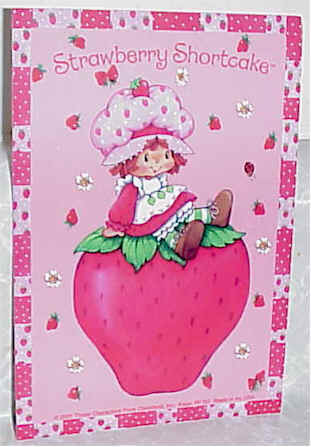 Strawberry Shortcake-the darling of the berry patch-sits atop a ceramic strawberry box on a cushion of green velveteen leaves. 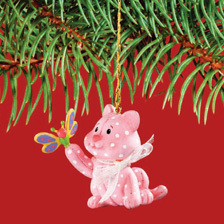 She's as cute as ever, and she's ready to add her sparkling personality to your holiday cheer. A Berry Merry Christmas from Strawberry Shortcake's kitty, Custard! And guess what?! She's strawberry-scented! This mini ornament of Custard and her butterfly friend just couldn't be any sweeter! 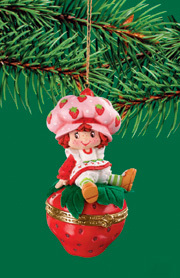 Strawberry Shortcake and her friend, Custard Christmas Ornament. In her traditional red dress, bloomers, and hat. This is a new set of five SS Miniatures from Japan. 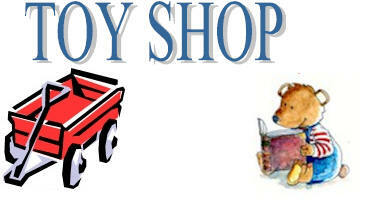 They are not officially licensed. No markings or tags. 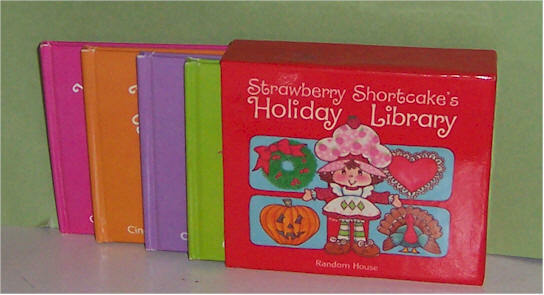 Included in the set: Butter Cookie, Blueberry Muffin, Strawberry Shortcake, Raspberry Tart, Apple Dumplin. Made out of rubber. Comes in plastic holder.